Of late, Lynn and I have been working on transitioning into fall cocktail/wine mode. This typically means circling back to bourbons, heavier reds, some port and maybe some experimentation with scotch. As always, we remain on the lookout for something new to add some snap to our concoctions. Ironically, what we found was Snap liqueur. Snap is the result of the distillation of a traditional lebkuchen (a homemade ginger snap made with black strap molasses and fresh ginger-far superior to the grocery store variety). The result of this is that not only does Snap reject some of the over processing of it's core ingredients it actually contains elements that are essential to good health like iron, potassium and calcium (mainly found in the traditional black strap molasses) as well as a good, earthy flavor. 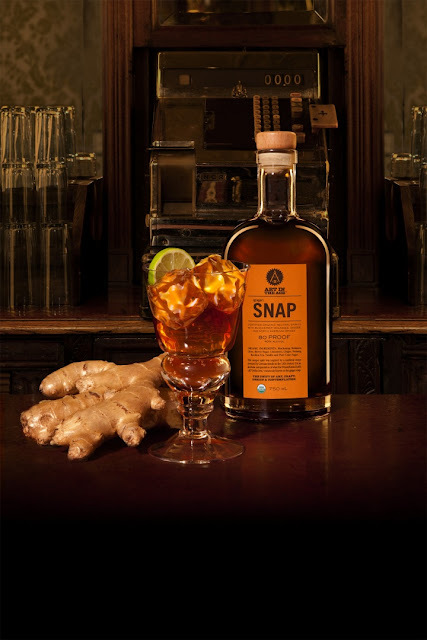 Snap is surely not the first ginger infused spirit on the market; however, it sets the bar quite high as it is both organic and made with pure ingredients.